This time I gave my new year's resolutions some serious thought. It was much needed as 2014 was a crazy one for me - from the very first to the very last day. As much as some fantastic things happened, I've also been overwhelmed with everything. From a personal, but also a general and current event front. And well the year did not start well, as it's been an incredibly sad week for me, from the starving, freezing children in Syrian refugee camps to the horrific attacks in Paris. 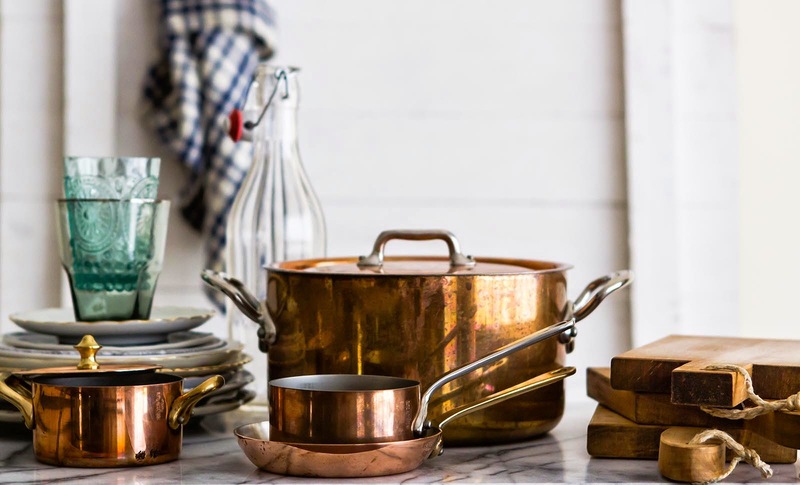 I don't mean to sound strange writing this post, and my apologies if I do, but as I've said before this isn't just my food blog, it is my online journal. And well sometimes it’s not just about that recipe of mine. Certainly, I don’t need to explain how unacceptable it is that kids are dying of the cold in this day and age. And to actually start doing something instead of just babbling, I've gathered all extra clothes, blankets and canned food that I have at home. There is a scheduled pick up for supplies to aid refugee camps tomorrow and Tuesday that I know of in Dubai, so if anyone reads this on time and would like to help, please email me directly. To the other horror story.. I grew up in Paris, and Charlie Hebdo was part of my life, so what happened was close very close to home. I have always loved the raw French press, it's part of France the way that the baguette is. This was a despicable act of terror, and I am tired of reading posts about people saying that more humans are dying elsewhere under more atrocious circumstances, "so let's just not make a big fuss about this one". Dying is dying. Nobody's life is worth more than another – let’s put that straight. It doesn’t mean because I stand for Charlie or Ahmed (the Muslim cop who defended free speech) that I don’t stand for all other injustices out in the world. But this happened and we cannot just say well there is worse in the world, so let's move on people. Needless to say that I respect all faiths, but I must say that I myself am not religious, especially not in the world we live in where religion is causing so much suffering. Equally, I do strongly defend the principle of freedom of speech. My big issue with the Middle East is NOT having that freedom actually. And in my humble opinion, free speech is either there or it is not, as it's too subjective to draw the line where it suits everyone's feelings equally. So there is no in-between, whether we like what we hear or not. It's up to individuals to choose whether they wish to be kind, tactful and considerate, but the fact is that we should all have the right to express ourselves. Certainly, we have the right to disagree and defend, yet without terrorizing people. No need to mention all my surrounding thinks these acts were horrific and against religion in the first place, but some believe there is a fine line that should not be crossed when talking about religion - but I disagree. So I know not all my family, friends and those who read my blog share my thoughts - God knows I've had heated discussions about these subjects. But that is alright, and let us all agree to disagree. I accept that, as long as we all respect one another. I like to believe that I am a rational human being, not biased, as I have loved ones on both sides of the trade, and after all I am an Arab who grew up in the West. Please do not misunderstand, I am not blowing my own horn as a judge of things, I am just explaining what I think leads me to be neutral in these discussions. For instance, my parents and extended family are traditional and religious whereas I am not, and I have constantly had discussions about related issues. So really, the two sides of the story have always been part of my life. But today, more than ever, between me and myself, I feel at odds not only with what is happening right now but as if I’m being pulled in two directions, I feel content then sad. On the one hand I'm incredibly blessed with exciting opportunities in this life, and on the other hand I am reminded daily that my part of the world could not be in worse state. There is simply too much suffering around me, especially with the Syrian humanitarian catastrophe today that is ongoing, and so close yet feels far. The war around us has been going on for far too long, the Syrian refugee crisis is the largest of our time, children are dying of hunger and cold. And at the same time I feel incredibly silly worrying about whether the greens I’m feeding my kids are organic? Posting one second about the most serious of subjects, and then I Instagram a picture of my food. How can I ignore the duality of this? I may not know how to express this, but something feels off. I feel blessed and guilty at the same time. I feel like life must go on regardless of what is happening, and who am I to change anything. Yet at the same time, I know there must be something I can do. And I don't mean just gathering extra clothes. So the little Syrian born in London to German parents, raised in Paris and New York, who married a man from Beirut and currently lives in Dubai (true story) is not at peace to say the very least. The world has gone nuts, and maybe me with it! So this year, inshAllah, I will try my utmost to do more meaningful things with my life, one way or another. Surely I will not find a concrete solution, but to be honest just saying it out loud makes me feel like it's starting me off on the right track for 2015, inshAllah. So this year's resolution is to pay it forward somehow, on an ongoing basis, nothing that I wish to make official, just between me and me to honest. 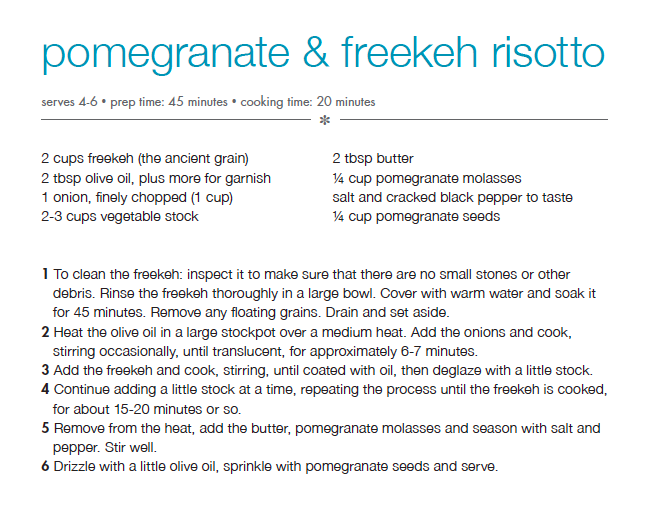 So in the spirit of being pulled in two directions, today’s recipe is my Pomegranate & Freekeh Risotto. Freekeh is a usual suspect in Middle Eastern and especially Syrian food, and it also reminds me excessively of my mother's cooking. Mami lives in Beirut and just writing this makes me miss her tremendously. 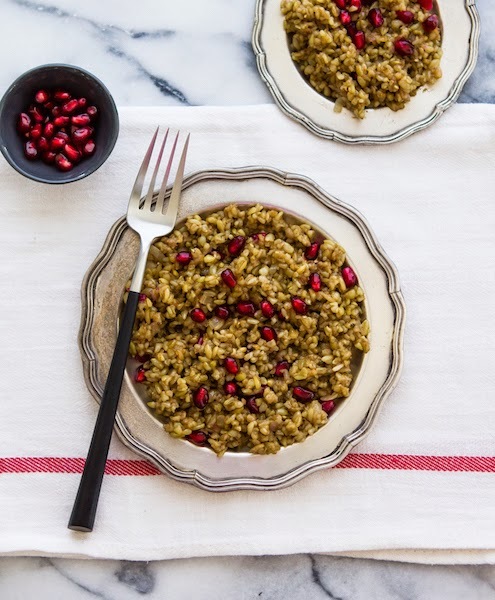 Freekeh is green wheat that is harvested while it's still young, then roasted which gives it that slight smokey and nutty feel. I made a risotto out of it – as I love making those and find it extremely therapeutic to be stirring away. It's absolutely delicious, wholesome and one of my staples at home. From my book "Food, Love and Life from Dalia's Kitchen"
Well said. Hope 2015 will be a better one.. love this dish!